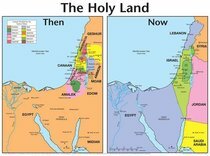 The Holy Land: Then and Now compares a Bible map of the Holy Land during Old Testament times side-by-side with a map of modern-day Holy Land. The clear, colorful map with large print provides a simple way of enhancing Old Testament stories of Moses, Joshua, the 12 Tribes, Joseph, the kings of Israel. 19" x 26" heavy chart paper. Reproducible worksheets on back. About "Wall Chart: Then and Now: Holy Land (Laminated) (Then And Now Series)"
Order now to secure your copy when our stock arrives. Other edition is available. 9781596362932 0 Available. Expected to ship in 5 to 6 weeks from Australia. What countries today occupy the Bible lands of 2,000+ years ago? Are the borders of Persia in Bible times the same as the borders of Iran today? The answers to these questions and many others are found in the Then - Now Bible Maps eBook. This fascinating reference tool contains seventeen Bible maps showing the locations of ancient cities and countries in comparison with modern-day cities and boundaries. What a great way to compare places in today's news with places in the Bible. "The Holy Land: Then - Now" shows the historical and modern-day names of cities within the regions occupied by the Twelve Tribes and how the Twelve Tribes divide up the land. Then - Now Bible Maps is a fascinating resource that you will refer to again and again when you are studying the Bible. A 21.6 x 14cm pamphlet that unfolds into a metre-long series of 17 full-colour maps. Ancient geography is combined with modern political boundaries.